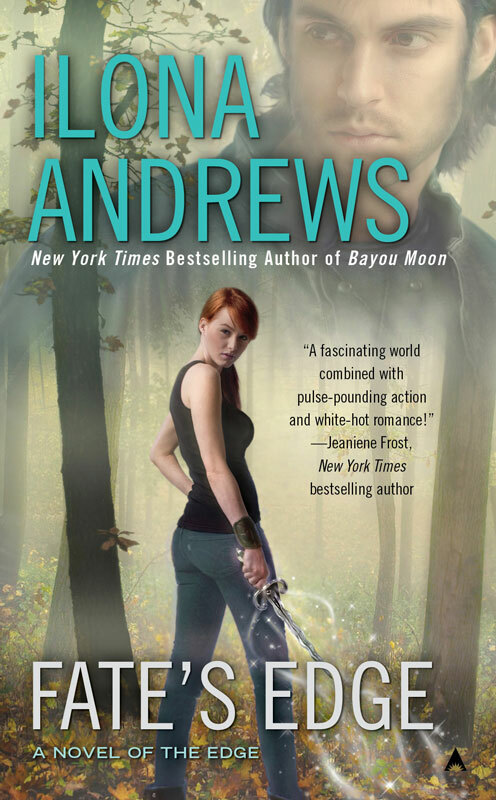 And here's the cover for the third novel set in Ilona Andrews' Edge universe--Fate's Edge . Due out November 29th, there's no synopsis yet, but you can read a very intriguing snippet from the beginning of the book over here. I love the cover. Love the women and swords theme this series has going. Kate would be proud. I like the cover and can't wait to read the book. Yay! Thanks for the alert! 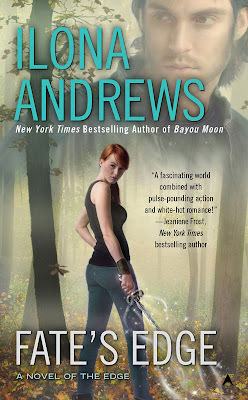 I read the snippet and promptly put this on my wish list! I love the Edge books! That is a neat cover. It shows a lot. Probably the best cover of the series to date. Love it! Loved the snippet, Audrey seems like the perfect match for Kaldar. This is my favorite cover in the Edge series so far, it's much more subtle than the other covers. I want to do a post about this too but I'm having problems uploading the image to WordPress. Oh! Love the fallen leaves and the misty light and the red hair. A very beautiful and atmospheric cover. I agree with Chachic on it being subtle. Definitely my favorite of the series. Love the girl/woods, cannot stand the big floaty head of unshaven, unkempt man. :\ I really wish there was never a floating head in the first book because now they have to do the same thing with all the Edge covers. omigosh, thanks for posting, i had no clue any info was out on the next one yet *squeezes eyes shut* please be about shape shifters please be about shape shifters. i loved William and Jack the best but from the excerpt its hard to tell what the H/H will be. blueblood who lives in the Edge/Broken? Cover is great, her red hair is a centerpiece. I like it! I am a book cover junkie covers like Fates edge appeal to me, the cover is beautiful. Oh November, you are so far away!